NOTE: Originally published in 1999 by Chameleon Books, an imprint of André Deutsch, Ltd., UK. "This book is a great little package. It consists of 50 checker play and 50 cube problems, with some brief introductory material on objectives, rules, etc. The positions range from obviously easy to deep thought provoking. After working through the problems you can estimate your Elo rating based on the author's observed experience of other players answers. This book has a number of things going for it. Firstly its cheap so good value for money. Secondly its small and easily portable  just the ticket to leave in your jacket pocket and thumb through while on the train/bus etc. Paul's concise 'Tips' and 'Hints' for each problem are a great feature which sum up the important issues in handy memorable 'sound bites'. "I have about a dozen backgammon books and this is one of the better ones. The positions included cover a huge range of situations and teach a lot of useful key positions. I find his tips and various rules of thumb highly educational. Personally, I much prefer Lamford's writing style to Robertie's. It's clear, helpful and straightforward (not sensationalist). His PRAT (position, race and threats) advice on doubling is something I've seen nowhere else, and it's a very useful tool indeed. 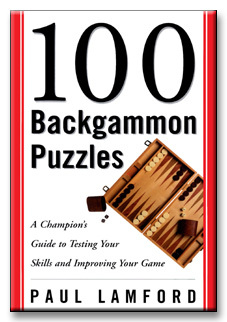 COVER: 100 Backgammon Puzzles contains fascinating and challenging backgammon puzzles that can be enjoyed without ever setting up a board. The first half of the book presents decisions on checker plays, while the second half deals with decisions on whether ot double and whether to accept an offered cube. The book begins with a brief, yet thorough, introduction to the basic strategy of the game, and below each illustrated puzzle are some valuable hints and tips to help guide both the experienced and casual player. Also included is a handy glossary of backgammon terms and a chart for converting score to international rating. AUTHOR: Paul Lamford was 1993 British Backgammon Champion and is currently the highest-ranked British player. He is the author of The Amazing Book of Casion Games.